Doctor Who: Revisting NIGHTMARE IN SILVER | Warped Factor - Words in the Key of Geek. 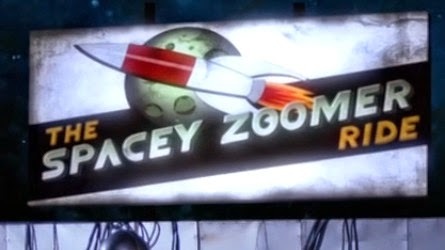 Tony Fyler rides the Spacey Zoomer. The Cybermen have, over the course of their 50 years of Doctor Who history, not been treated well in terms of story. For creatures supposedly governed solely by logic, some of their stories have been tortuously over-complicated, and in others, particularly in recent years, there has been more of a focus on their visual, stompy-monster threat than their philosophical underpinnings or their actual reason for being. As such, it’s a bit of a mystery why, of all the Cyber-stories in recent years, many fans find Nightmare in Silver to be something of a let-down. In the first instance, it’s actually about something that matters to the Cybermen – rebirth, the relaunch of their race as a power in the universe, some long while after defeat in a massive Cyber-war. For contrast, this is essentially the same basic premise as Revenge of the Cybermen, with its handful of almost glam-rock-shiny, seventies Cyber-groovers. 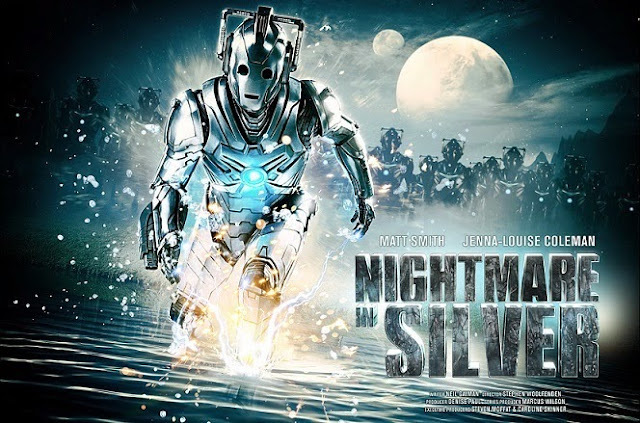 But Nightmare in Silver actually addresses the fundamental nature of what the Cybermen are, and what they are reported to do, but have seldom ever actually been shown doing – upgrading, evolving, adapting to new circumstances by patching in new abilities, new realities about themselves. This, if anything, is the reason Cybermen want to make more of themselves – they exist to defy death, ageing and disease, and they want to make more of themselves because they honestly believe that they are better than everything else. If they’re going to be based on logic, and they’re going to believe they’re better than everything else, there has to be a reason why they believe that. The reason is that nothing should phase them. Very little should kill them. And every stratagem of those resisting their inevitable supremacy should be counteracted by a rapid evolution. 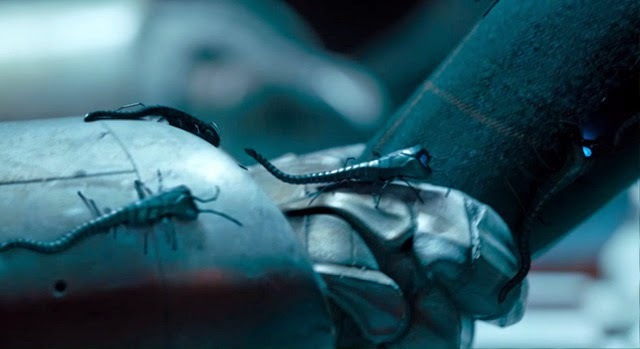 There are of course very good practical storytelling reasons why this has never been shown on screen before – if you have a creature with the potential that the Cybermen have, you have very little story: you have a marching army of Cybermen, you have their enemies trying to resist, you have their enemies’ resistance failing, and you have the Cyber-army growing. Or, conceivably, you have their enemies left with no alternative but to blow up the planet on which they happen to be standing. This is what the Cybermen should be – but it does make for fairly monotonous storytelling. 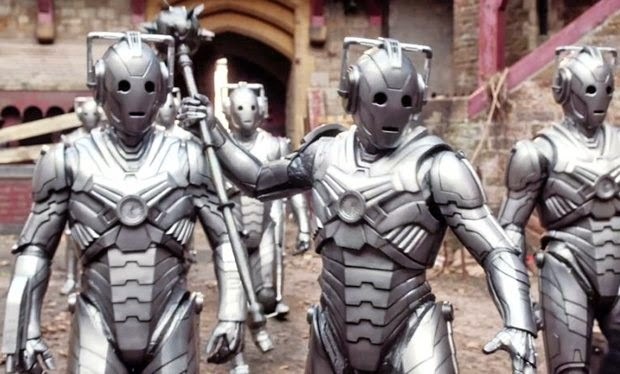 But since it’s never been shown on screen in 48 years of Cyber-history, you have to give props to Neil Gaiman (and who, after all, doesn’t give props to Neil Gaiman for one reason or another) for deciding, just once, to really show what the Cybermen genuinely are. It’s true, there’s a hint of a sixties Doctor Who annual about the beginnings of the story: The Doctor and Clara taking her two young ‘wards’ on a jolly whizzo space adventure – including the Spacey Zoomer! – but this sense quickly drops away once they’ve bounced about a bit in zero gravity and the Doctor has noticed the strange insects and night falls. All the jolly fun drops down to dark shadows and forebodings as the children are packed off to bed and, inevitably, Angie goes wandering off to investigate the punishment platoon. It’s also true that there seems to be no particularly good or logical reason why the punishment platoon should have been sent to this particular space-rock, other than to provide the handy expedient of a bunch of soldiers to fight the Cybermen, and a really big bomb. But in its core elements, Nightmare In Silver makes significantly more sense than most other Cyber-stories in the show’s history. They have been there on this insignificant planet, quietly rebuilding their numbers by stealing the children who used to visit and turning them into their new recruits, their new army, just waiting for the right brain to become their Cyber-Planner. And with the arrival of new children, the time has come. The Doctor’s strange insects start scuttling, and the Cybermites do their work. The Cybermites are a creation of genius – synthesising the idea of the Cybermat as a servant-creature and the idea of nanobots as tiny repair or conversion droids – we imagine the new Cybermen have a system full of Cybermites to perform the upgrades of which they speak, and to begin the conversion process in organic humanoids they encounter. The idea of fast Cybermen is so obvious it’s frankly amazing it’s never been shown before, so Gaiman gives it to us – if you were a creature that was an organic brain in a constantly evolving metal body, why would you choose a slow, noisy one? No, you’d be as fast as possible, as efficient as possible. Likewise with the scenes which many fans thought made the Cybermen too jokey in this episode – the detached body parts used as decoys. But again, this is what the Cybermen are, or should be: since the re-statement of them in New Who as an organic brain in a body mainly made of metal (with, we assume, most of the rest of the inefficient organic body jettisoned), the head should be able to function independently, and there’s no reason why, given a coherent program matrix of Cybermites, individual limbs shouldn’t be able to function strategically and separately too. This is the Cybermen functioning logically for once in their on-screen career. When the first of the upgraded Cybermen makes its appearance and steals the children, the resurrection of the Cybermen can be put into operation rapidly – but then a better plan immediately suggests itself, and the Cybermen switch tack. They don’t need the children to be their Cyber-Planner: not when there’s a Time Lord brain available. 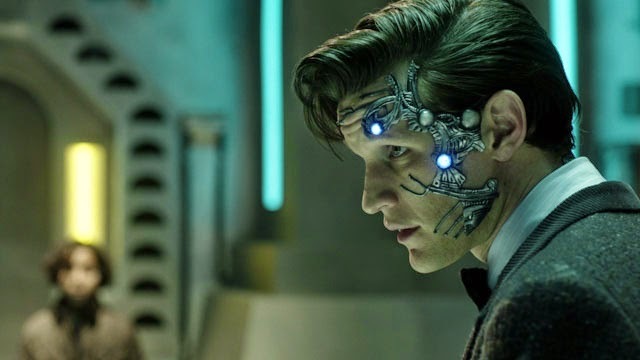 The Eleventh Doctor’s frantic and massively camp battle with the Cyberiad trying to rewrite his brain and bring him into the system as the new Cyber-Planner (that’s Mr Clever to you) has been seen by some fans as antithetical to the idea of emotionless, logically-driven creatures, but this misses the point quite spectacularly. The Cybermen respect the brain, and they have learned to make use of its creativity, its organic impulsiveness – but within reason, and only in their Cyber-Planners. Possibly they’re assimilated details of the Dalek-Movellan conflict and appreciated the need for an organic work-around for pure logic in strategic situations. The battle is also played out in a way specific to the Eleventh Doctor – every Doctor would have had a similar battle, but the specifics would have been different, because the personalities would have been different. Ultimately, we see the cunning of the Cyberiad, trying to manipulate Clara, and succeeding to some extent. With millions of revived and upgraded Cybermen on the march, the Doctor and the Cyberiad play a logic game for control of his brain – and the Doctor once again teaches the Cybermen the value of that organic intuition, by cheating (which is ultimately a way of working around the rules). But still, in the final analysis, when you have a foe as dynamic and unstoppable as the Cybermen should be, blowing them up with love should not be an option. Blowing them up with a massive, massive bomb – yes. And ultimately, there’s no alternative at the end of Nightmare in Silver – it’s the only way to beat a foe that just keeps on coming and assimilates your soldiers. Nightmare in Silver is an example of the kind of storytelling you cannot do too often. But it’s an example of absolutely what the Cybermen should occasionally be seen to be like – implacable, unstoppable, evolving round every obstacle and leaving you nowhere to go. In the history of the show, they’ve been killed with everything from gravity to radiation, gold dust to cleaning fluid, their own self-realisation, and *ahem* love. Nightmare In Silver stands alone in painting them as an galactic threat, and admitting that what you need to defeat them is not cleverness, because they can think their way around cleverness faster than you can create it. Some threats, some bullies, you have to beat with a show of brute force, and if you’re human, rather than a super-intelligent Time Lord who aims to be better, your only real option is to hit them, hard, before they can lay a Cybermite-infested fist on you. There are elements of the storytelling that are questionable, and that make it seem like it’s aimed at younger fans, but in terms of the representation of the Cybermen as a real, logical, implacable threat, the show has never done better. Nightmare in Silver is the apotheosis of that thrill in Tomb of the Cybermen when they wake up en masse. It’s why the Invasion resurrection thrills. Why the sight of all those reviving Cybermen in Earthshock sends chills down your spine – it’s the ultimate on-screen realisation of the idea that when the Cybermen march, you cannot run and you cannot hide. You cannot reason and you can’t out-think. You can only kill or be killed: that is the true nature of the nightmare in silver.